Where do I use my Blacks voucher code? Browse through the deals available here at NetVoucherCodes and select ‘View Deal’ to head over to the main site. Shop for good you wish to buy and add them to your online shopping cart. Once you have finished browsing, select ‘Checkout’ to review your order. Insert your code into the ‘Voucher Code’ box provided and select ‘Apply’. Discount will be applied once you complete the checkout process. "10% off with student discount." Blacks are a retailer who specialises in everything you could want to experience the best of the great outdoors. Their huge range of outdoor clothing includes jackets, gilets and vests, coats, fleeces and waterproof trousers for those more overcast days, and shorts, sun hats and sandals for the summer months. They’ll keep your feet well protected, too, with mountain boots and hiking boots, wellingtons, trail running shoes and even snow boots for men, women and kids alike. All the top brands you’d expect are on display, from Timberland and The North Face to Berghaus, Merrell and Technicals. You’re in the right place for equipment too, with tents of all sizes and camping furniture available plus rucksacks, holdalls, sleeping bags & mats, knives & tools, cookware, stoves, first aid and loads, loads more. As well as great deals on outdoor equipment, they run a regularly updated Life Outdoors blog about them, as well as in-depth guides on buying and caring for jackets, plus picks from the experts who really know their stuff. In the Men's clothing collection at Blacks, you can expect to find gear that won't let you down when you need it the most! Explore the fantastic range of men's outdoor clothing including waterproof jackets, walking boots, fleeces and baselayers featuring some of the biggest brands including The North Face, Berghaus, Craghoppers, Jack Wolfskin and so much more! Be sure to check Blacks out for all the latest clothing and gear when you prepare for your next outdoor adventure. Specialising in over 150 years in the business, Blacks are experts in providing outdoor essentials so you get the most out of all your adventures! The women's clothing range features all the biggest and best brands in the industry featuring the likes of The North Face, Berghaus and 66º North. Find a whole collection of clothing, footwear, equipment and so much more. Everything you need for your next outdoor pursuit can be found at Blacks! Check out the fantastic collection of men's, women's and children's footwear today at Blacks, where you're sure to find the perfect style and fit for your outdoor needs! Browse from leather and fabric walking boots, approach shoes, industrial boots, travel and urban shoes, sandals, slides, wellingtons, running shoes, all-terrain shoes and aqua shoes! Whatever your pursuit, there really is a style to suit your needs. Featuring some of the best brands in the industry including The North Face, Salomon and Merrel. Not only can you find a superb collection of footwear, but all the accessories you need such as laces, insoles, socks and much more to ensure your feet are fully kitted out! If you have decided that you'd like to cancel your order, you have 7 days to get in contact with Blacks to cancel. If I purchase items in bulk with I get a discount? Yes. Please email Blacks with details of the items you require including quantities so that they can check availability and get back to you with the best possible price. Yes! Simply follow the link in your dispatch email and the carrier will show you where they’re up to with your delivery. Find more information here. 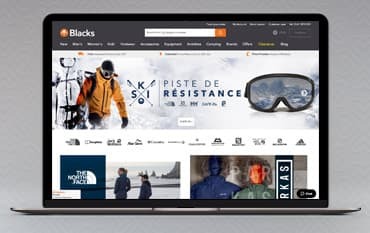 Blacks is the largest outdoor retailer in the UK with stores nationwide. Grab a Blacks voucher code and save on a wide range of brands such as North Face, Berghaus, Peter Storm, Columbia, Merrell, Salomon & Osprey. Blacks also offer a price match guarantee on everything and will always be 10% cheaper so you can be sure to find the right outdoor equipment at the right price. Get free delivery on all orders over £70 or free click and collect in over 500 stores.